Good heavens, it’s amazing how many podcast equipment lists I read through and yet STILL I ended up having to buy more and more stuff as each time I bought a new thing, it turned out I needed some other thing to go with it. 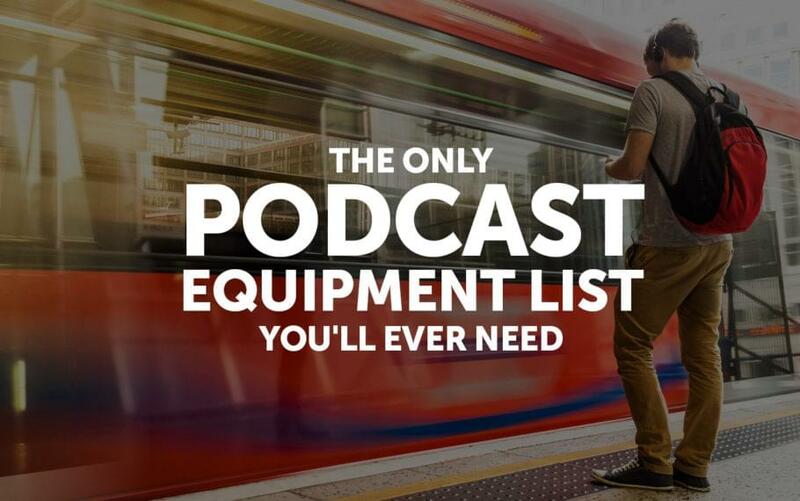 Here’s the entire list of everything I use–if your podcasting needs are similar to mine, you won’t need anything other than what’s here. Record straight to my computer via USB. Get high quality voice recording without background noise. Minimize the need for any special software. Save space on my desk. Save time–didn’t want to have to do a bunch of set up each time I recorded. Does that sound like what you’re trying to do? Then let’s dive into the list. I started out with a Blue Yeti mic and you know what? It’s a pretty good mic, but it picks up a lot of background noise. Still, it is quite affordable. But if you’re going for affordable I recommend the Audio-Technica ATR2100, which is also a very portable mic. It’s half the price of the Yeti, and smaller and lighter. Pair it with a Dragonpad USA pop filter and a $9 carrying case and you’re good to podcast from home, work, or on the road. Heil PR40 Microphone – It cuts out background noise like a pro. I live in a high rise in a noisy part of a big city in China with LOTS of noise outside like jackhammers, street washing trucks playing It’s a Small World (don’t ask), honking cars, yelling joggers, and happy children, and it’s great at picking up my voice but not all that other stuff. I run the air conditioning while I’m recording and it’s not an issue at all. Boom Arm – This is definitely worth it, and yes, you need to get the Heil boom arm, not some other cheap one. Having this boom arm means the mic is right where I need it, when I need it, and the rest of the time it’s easily out of my way and not taking up desk space. By the way, I also bought the vertical wall mount for the Heil boom arm, but decided that the clamp that is included and which attaches to my desk is actually more convenient. Shock Mount – This is the thing that makes it so when you bump the table your mic is connected to it doesn’t produce a bump on the recording. Plus it looks really cool, so def must have. Pop Filter – Just about any cheap pop filter will do, but if you want one that is made specifically for the PR40 then get the BSW RE27POP (no, it’s not available on Amazon). Funny side story, I ordered mine and when I got it the welding was off and so the pop filter was slightly misaligned. It wasn’t really an issue for recording, it just looked kind of funny, but I figured hey, I paid for this thing, I should get one that isn’t defective, even if the defect is only cosmetic. I contacted customer support with a photo and the guy instantly wrote back and said “So sorry, that’s totally unacceptable, we’ll get you a new one right away, no need to ship the other one back.” They shipped the new one to me, and guess what? It’s also misaligned, exactly like the other one. I suppose if I were an unreasonable man I’d ask for a third, but hey, it still records fine, I’ve now got a backup, I think we can call it even. Custom Mic Flag – If you’re going to do video like I do, then it’s a way to get a little bit of advertising on the screen the whole time you’re talking. I got my custom mic flag from Impact PBS and they did a great job, super fast shipping, etc. It cost a little more than I was expecting but I needed it done fast and right and didn’t have time to mess around, and they were fast and got it done right, so I’m happy. At this point I thought I had everything I needed. What else could there be? But then everyone started telling me that my recordings were too quiet. What the heck? I just spent all this money, how could the sound not be incredible? Several hours later, what I learned was that I needed more “gain,” which in my world of trying to resist eating too much Ben & Jerry’s is a bad thing, but in the podcast recording world it turns out to be something good. CloudLifter – Not only did I need gain, I needed 25 DB of “clean gain,” and apparently the thing for that is this CloudLifter device. Frankly, when I started reading things like “Uses phantom power to give passive mics (mainly used for dynamic and ribbon mics) up to +25dB without passing phantom power on to mic,” my eyes started to glaze over and I felt this was just way too much to ask of me to read stuff like this, but I bought the thing, and it works, so just buy it already and skip trying to understand it all if you’re intent on getting the results and don’t care how you get them. Focusrite Scarlett – But wait, there’s more! I thought that bit about phantom power and passive mics meant I didn’t need anything else. But if you’re going to use a CloudLifter then you need something to give it power, and USB isn’t enough. It only took me several hours to figure out my CloudLifter wasn’t defective, and that I needed one of these Focusrite Scarlett Solo (2nd Gen) USB Audio Interface thingiemajiggers. Fine, another order on Amazon. At this point it wasn’t the money I was spending that bothered me, it was that nobody told me I needed any of this stuff and it was taking me all sorts of time to figure it out on my own. The Focusrite was only $70, the CloudLifter was $150, so it’s not like I was going to go bankrupt buying these things, but my time? That’s worth a lot more. Well, he convinced me. I decided to stick with the Scarlett. No regrets so far. Except for one thing…when you record with the Scarlett it puts everything on a single track, on the left speaker. In other words, if you go back and listen to your recording it will only be coming out of the left speaker or headphone. It’s not big deal for a sound engineer to turn this into stereo, but it’s something to be aware of and I’d prefer that the Scarlett had a setting that would allow you to switch between mono and stereo, but there it is. I’m guessing the Apollo doesn’t restrict you this way, but is that worth an extra $750? I’ll let you decide. This is the one area on this list I feel like isn’t finalized, and so some part related to this may change in the future. Cables – Somewhere in this process you’re going to need an extra mic cable. They’re cheap, you should buy two. I may have overdone it on these, but I wanted to hear what I really sound like without a bunch of outside noise coming in my ears, and these Audio-Technica ATH-M70x headphones get that job done very well. My only gripe with them is that even with the padding my ears touch the inside part and get a little sore after a few hours, but it’s very minimal. Overall I’m very happy with these. Yes, it’s worth investing a bit to absorb sound in your recording space and and improve the acoustics, but there are a few tricks. The easy part is that you can buy pretty much any foam tiles and you won’t go wrong on those–they’re cheap and they’re all pretty much the same. Now, here’s what I spent a lot of time and money figuring out–how to attach them to walls so they don’t fall off, especially in humid climes. The big secret here is the Command strips from 3M. Trust me, I tried all sorts of stuff, and ruined the paint job in my home office before I found these. Not only did they stay stuck to the office walls, but when I went to move then sure enough, they peeled off and left the paint job intact, which was pretty incredible because the place we were renting used terrible paint that was falling off all over the place. If you have any problems with these sticking it’s going to be that they don’t stick well enough to the foam, in which case just use some Gorilla Glue or something to glue one side to the foam, and then you’re good. Seriously, if I had been able to read the above paragraph before I started all this, it would have saved me a ton of time and a lot of money paying a guy to come repaint the office. Ugh. Just to be thorough, if you’ve got one of the new Macbook Pros, like I do, then you’ll need a USB adapter to plug your USB cable from the Focusrite Scarlett into your computer. BTW, don’t buy one of those new Macbooks until you watch this. Yeah, I thought it was funny too, then I bought one of those Macbooks–I’m not laughing anymore. So here’s the thing…YouTube is fast becoming the biggest podcasting platform. Yeah, yeah, iTunes is still the big one, but get ready for YouTube to be the next hot thing for podcasters. That doesn’t mean you have to put video up there, you can just put audio up there and people can play the audio and listen to it. It’s easier than listening in iTunes, right? Apple is pretty good at designing hardware and some software but iTunes is a mess if you want a simple podcast listening experience and YouTube is about to eat their lunch as they get YouTube Red dialed in. Easy for guests to sign in and use. I’ve already done 40 interviews with it and have had virtually zero complaints from guests. Records separate audio from video, and also separate audio for you and your guest, which allows a sound engineer to do good things with it. Records to your local computer. I’ve tried Skype and other webinar software and I just don’t find anything else as reliable. Full disclosure: I don’t do this myself. It’s above my pay grade. Instead, I created a podcast management company within Influencer Inc that handles this service for me as well as clients. Andrew, our podcast manager, tells me he does all his editing and mixing in Audacity, which John Lee Dumas, master of Entrepreneur on Fire, also recommends, so I figure it’s a safe recommendation. However, others use GarageBand or Adobe Audition, and I’m not going to tell you you’re wrong to use them yourself. Libsyn – Let’s just make this easy, there’s no other option worth considering at the moment. There are affordable versions, but you can go pro if you’re going to do a ton of episodes and you’re positive it’s going to be high traffic. I also use the Libsyn plugin for WordPress to put the audio on my website. Of course if you’re going to do video then you need a webcam and right now the best thing I’ve found is the Logitech C920 for about $60. It’s hard to beat the price and quality on this one. You could go for the Logitech BRIO with 4K for 3x the price, but at the moment I have to ask, why bother? 1080 is plenty for recording a podcast interview where it’s just two talking heads. If you’re going to do video then a little bit of good lighting goes a long way. I went with the Interfit F5 3-Head Continuous Fluorescent 5600K Daylight Lighting Kit and yes, it makes a big difference, but I sometimes wonder if I bought the right kit. They’re big, bulky, and not easy to transport. They’re also not super high quality. I sometimes wonder if I should have just gotten these. By the way, if you buy replacement bulbs make sure you get blue bulbs, not the yellow ones, which make you look yellow instead of natural. Blue is the color of outdoor light. When I travel and do video I’m going to try out a pair of LED lamps like this or this. Not ideal, but better than normal hotel room lighting. Did I miss anything? Anything you would add? Don’t like one of my picks and think you have something better? Let me know in the comments below! Q: Where do I sign up for your podcast? A: 40 episodes are already recorded. It will launch October, 2017. Subscribe to my email list to stay in the loop.